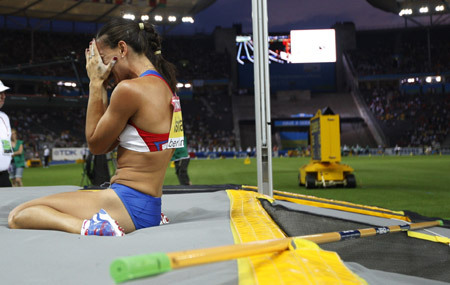 World's all-time great women's polevaulter Elena Isinbayeva suffered her first defeat in six years in major competitions while legend Kenenisa Bekele won his fourth men's 10,000 meters title at the World Championships Monday. Olympic champion Shelly-Ann Fraser of Jamaica was crowned the world's fastest woman and became the fourth fastest woman in history after running 10.73 seconds, only behind Florence Griffith-Joyner, Marion Jones, both of the United States, and France's Christine Arron. Isinbayeva, 27, has won everything since 2004 but failed to clear a height in three attempts, once in 4.75 meters and twice in 4.80m. Poland's Anna Rogowska took the title by clearing 4.75 meters. Her compatriot Monika Pyrek and American Chelsea Johnson shared the silver with 4.65. It was actually the Russian's second defeat since 2004. She recorded her first, also to Rogowska, on July 24 at the London Grand Prix. "I have no proper explanation for what happened today," she said. "I think it happened because it just must have happened. I hope I will recover from this." Bekele, also Olympic champion at the last two Olympic Games, ran behind Eritrea's Zersenay Tadese until the last lap. He sped up and pulled away for a comfortable win in a World Championships record of 26:46.31. Tadese won the silver in 16:50.12 and Kenya's Moses Ndiema Masai took the bronze in 16:57.39. 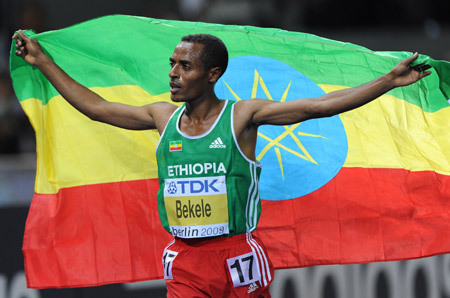 "It's great to win for the fourth time," said Bekele. "I am so happy. I planned already to stay behind until one lap is left and then kick." Fraser's compatriot and Olympic silver medalist Kerron Stewart finished second again in 10.75. American Carmelita Jeter, bronze medalist two year ago in Osaka 2007, was third in 10.90. Fraser said the time and win were no surprise for her. "The victory is no surprise for me and the time of 10.73 seconds neither," she said. "If you look at the time of the semifinals, it was clear that the final was going to be even faster." The men's hammar throw title was won by Olympic champion Primoz Kozmus of Slovenia. Cuba's Yargeris Savigne retained the women's triple jump title and Spain's Marta Dominguez won the women's 3000 meters steeplechase.